February 25th, 2008 : Cloudy and Cool, Water Temps 45* to 50* and Clear. Decided to go fishing this morning so I filled the bait tank at 9am and headed to the lake. Caught bait around 11 o'clock and called a friend and told him to meet me at the marina and lets fish for a few hours. He would be awhile so I set up where I caught the bait and pulled 2 small coves off the main lake with a few planner boards rigged with Herring. 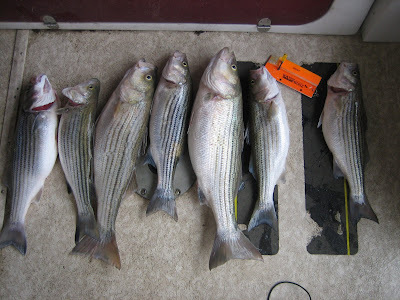 I never got more than 5 boards out without getting hit, catching 5 Stripers in about a half hour. I pulled out of the coves and ran some nearby flats just to see if the fish were relating just to the coves or were feeding everywhere in that part of the lake. After an hour and no more hits I knew the coves were the key. Picked up my friend and checked a few more coves out with similar success and decided to try something different. Found a few fish on a deep flat in 45 feet of water and put downlines on them and caught a few keepers . I decided after 30 minutes to try yet another pattern and ran a 20 foot flat with planner boards and a few downlines and we nailed them there also. This afternoon we had over 30 good strikes. I lost count of how many fish we caught but I did keep 7 good eaters to take home . The fish we caught ranged from 4 to 10 pounds, all males.